Fill your Grandma, Mom, Nana or Aunt's heart with love and joy when you give her this comfortable and unique Custom Printed Heart T-shirt. 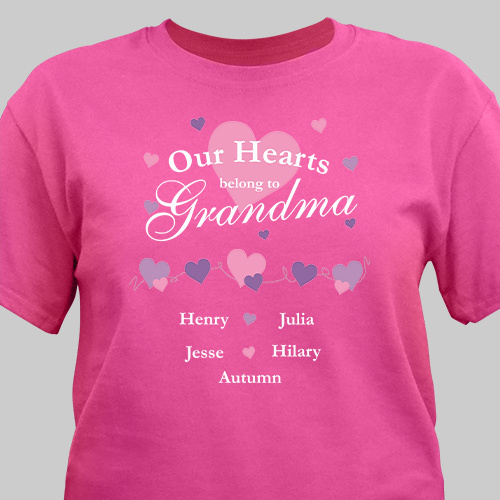 These Personalized Grandma Shirts are a perfect gift for Valentine's Day, Mother's Day or for a special Birthday with a splash of color accentuating her spirit and style. Shist was beautiful - good quality - received in record time. Will order from you again in the future. GiftsForYouNow.com is the leader in Personalized Gifts for Mom, Grandma, Nana, Aunt, Sister & Best Friends. We create thoughtful and personal gift which you will be proud to give year after year. Shop GiftsForYouNow.com today for all your Personalized Gifts for Her.